Although I have been to Ramen Yamadaya in Los Angeles (or Culver City if you wish to be exact), I am glad I made it out to the Costa Mesa location. It had been a cold day and ramen was necessary. The dining room is much more comfortable than the Culver Location. It feels like you can spread out and enjoy your food instead of hunched over your steaming bowl of noodles. I decided to get the tokotsu ramen with a small bowl of mabo tofu and rice. I remember loving the egg quite a bit at the Culver location but thought the Costa Mesa one was just fine. On the other hand, I didn’t mind the ramen. 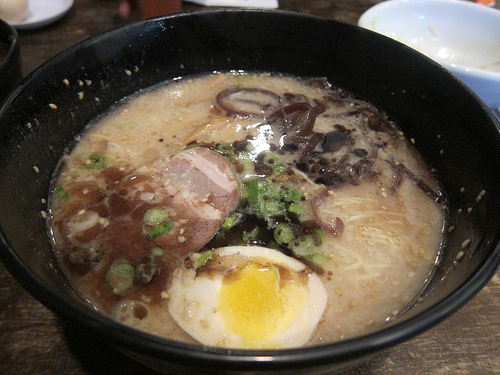 And the broth was indeed quite hearty and creamy with fatty globs. Still, it’s not as fatty as my absolute fave, Daikokuya. 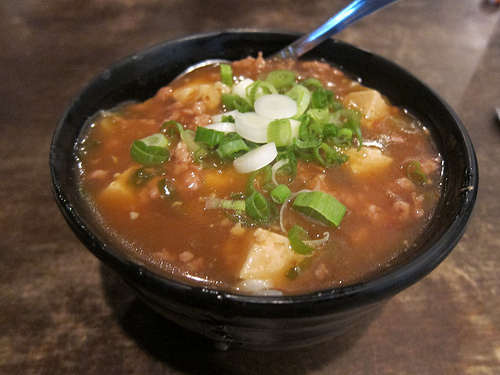 The mabo tofu was fine though I like a meatier, chunky sauce. This was almost all gravy. Still, the meal was satisfying. We were off to drinks next at ARC making it a lovely Sunday evening.